This set of Testing of Materials Questions & Answers for Exams focuses on “Dynamic Hardness Testing”. 1. Which of the following is a dynamic hardness test? Explanation: Poldi is a dynamic hardness test. Hammer blow is used. Brinell, knop and Vickers are static hardness test. 2. What is the standard height of impact for shore test? Explanation: A small pointed indenter is used in shore test. This is made to fall inside a glass tube. Standard height is 250 mm. 3. What is a weight of hammer in shore test? Explanation: The hammer is a small pointed indenter. It is tapered at one end and a cylindrical metal plug. It weighs 2.4 gm. Explanation: As the height of rebound increase, the material becomes harder. The size of the indentation decreases. It is because of less kinetic energy loss. Explanation: A specimen less than 1 kg must be clamped. It should have massive support. It is due to avoid inertia effect. 6. What is a disadvantage of shore test? Explanation: If a specimen is less than 1 kg, it should be clamped. Shore test gives very shallow indentations. It is a fast test. 7. Which test should be preferred for finished lathe machine bed? Explanation: Finished components shouldn’t have scratch or indentation on it. Shore test is preferred for it. It is due to very shallow indentations. 8. What is the height of Poldi apparatus? Explanation: Poldi apparatus is just 150 mm in height. Its ball indenter is 10 mm in diameter. It is portable. 9. What is the disadvantage of Poldi hardness test? Explanation: When the apparatus is not held perpendicular to the surface, it gives an error in the result. It is easily portable. It is cheap and can be performed on heavy machinery. 10. Poldi hardness test gives a value of ________ also along with dynamic hardness. Explanation: Poldi hardness test gives dynamic hardness. Values of tensile strength are also given in the table. These two have a linear relationship. 11. Tensile strength is given in tonnes per square inch in Poldi test. Explanation: The hardness is related to tensile strength. It can be seen in the tables. UTS is given in tonnes per square inch. 12. Hardness of heavy components can’t be measured by Poldi test. Explanation: The Poldi tester is portable. Hence hardness of heavy components can be measured. 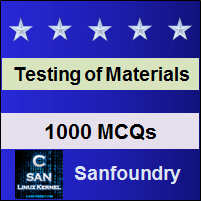 To practice all exam questions on Testing of Materials, here is complete set of 1000+ Multiple Choice Questions and Answers.